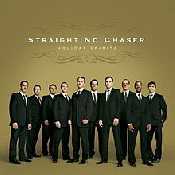 Holiday Spirits es el disco debut del grupo Straight No Chaser que nos presenta siempre canciones muy navideñas y festivas. 4. "This Christmas" 5. "Christmas Wish"
6. "Hark! The Herald Angels Sing/Angels We Have Heard On High"
10. "Sweet Little Jesus Boy"
11. "Christmas (Baby Please Come Home)" 12. "Carol Of The Bells"